Blend was the first cafe I started delivering cakes to. 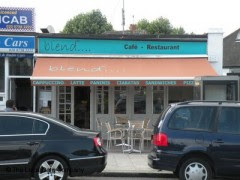 I am very grateful to Grish and Natalie for all the help and I finally found some information on the internet about Blend Cafe which I would like to share. On Tuesday there will be fresh brownies and apple cake, come by if you're around Brendford! Check Blend here for directions, etc.